Errors on your website drive away potential visitors, cause Search Engine crawlers problems and reduce the effectiveness of your SEO/SEM/PCC investments. 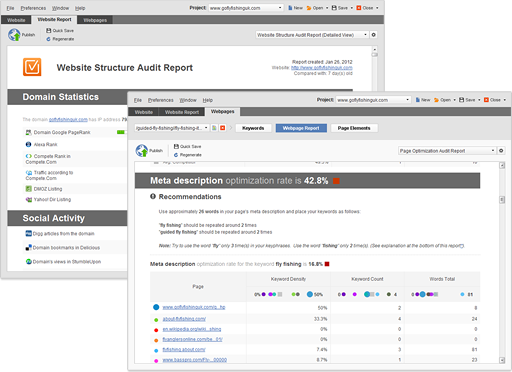 A website structure audit report gives you the detail needed to propel your website straight to search engines' top at unheard-of before speed, making essential on-page fixes & optimisations a picnic for you, whatever your knowledge or experience. A must-have requirement for any website aiming at 1st page rankings is that all the pages load properly. Loading problems on one single page will undermine the rankings of all others. An Astutium WebSite Audit Report details the Crawl Availability of your site, so you can instantly see HTTP status codes for all your pages to see if there are any load problems and what these problems are caused by. For your website to have a perfect reputation in Google's eyes and achieve the coveted page #1 position in its search results, all links on your pages must be valid. An Astutium WebSite Audit Report signals you if there are any broken links (internal and external) on your pages, so that you can fix them immediately. A clean report from a comprehensive website audit is a solid guarantee that all your pages are written in error-free and up-to-validation-standards of the HTML language. An Astutium WebSite Audit Report provides warning for you of HTML and CSS coding errors which will be hurting yoru Search Engine Rankings. The 3rd most important item on a page is the TITLE Tag (1st is the content, 2nd is the H1) - and should be unique for every page on your site. An Astutium WebSite Audit Report secures you against duplicate titles that are a major red flag to Google and seriously hamper your website's possibility of advancing to the cherished first page. An Astutium WebSite Audit Report lays out the data you need to organize your link structure in the most efficient way, so that it gives a solid boost to your rankings. Google PageRank is a major factor to determine your page's rankings relative to a competitor. PR is transferred from one page to another through links between them - more links to the most important pages re-distributes PageRank between your pages. An Astutium WebSite Audit Report breaks down what PageRank each of your pages has right now (so how much of it they can potentially pass with links). Social-factors (whether a site/url is being 'talked about') on social media sites indicates current popularity - giving a temporary boost in rankings. Major social media sources: Diigo, Delicious, Social Mention, etc may not influence the Search Engine results by much (0.1%) but are a solid traffic source - often of better qualified leads than straigh search results. An Astutium WebSite Audit Report means you can focus promotional efforts on the most profitable media sources only. An Astutium WebSite Audit Report checks critical features related to your domain - age, ip/location and traffic guestimations. Need more visitors, more conversions, more traffic and more sales ? Contact Us Today to discuss how we can help your website achieve the greatness it deserves.